With the incredible success of Royal Caribbean's latest ship the Oasis of the Seas, the cruise line have decided to offer some of the 'signature' aspects of the Oasis Class ships on the popular Freedom of the Seas and Liberty of the Seas. The updates scheduled for 2011 will include new dining experiences, entertainment and children's program. Following the success of the award winning Hairspray production on the Oasis of the Seas and the anticipated success of Chicago: The Musical that will debut on the Allure of the Seas Royal Caribbean have announced more Broadway productions. 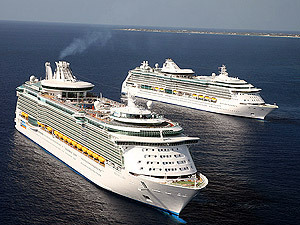 Liberty of the Seas is set to receive the yet un-named show. Inspired by the Aqautheatre onboard Oasis of the Seas both of the Freedom class ships will be receiving huge outdoor screens. The 18.5ft screen will take centre stage overlooking the main family pool and will feature a wide selection of films and entertainment. Another popular feature to grace these ships will be the Royal Babies and Tots Nursery. These childcare programs run from 6 to 36 months and also offer a fun and safe environment for toddlers too. Other additions to the Liberty of the Seas and Freedom of the Seas include the Vintages Lounge, for fine wines and the Cupcake Cupboard, offering fresh boutique styled pastries and cup cakes. These exciting new additions will give the already fantastic Freedom class ships a decadent facelift and will keep Royal Caribbean at the top of their game.